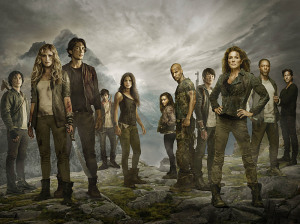 The 100 Episode #2.13 Spoilers: "Resurrection"
“Resurrection” is the name of the February 13 episode of The 100, and we’ve got a description with new spoilers thanks to The CW. DON’T FORGET THAT WE’RE THE GOOD GUYS — Clarke (Eliza Taylor) begins to question Lexa’s (guest star Alycia Debnam Carey) leadership decisions. Abby (Paige Turco) struggles to help an injured Kane (Henry Ian Cusick). Indra (guest star Adina Porter) continues to push Octavia (Marie Avgeropoulos). Meanwhile, at Mount Weather, Jasper (Devon Bostick) steps up into the role of leader, and Cage (guest star Johnny Whitworth) throws Maya (guest star Eve Harlow) into a life threatening situation. Isaiah Washington, Bob Morley, Christopher Larkin and Ricky Whittle also star. Dean White directed the episode written by Bruce Miller (#213). Original airdate 2/18/2015.